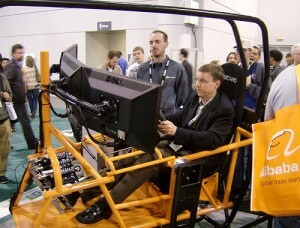 John will have more later on this topic as he had a chance to test one of the world’s top racing simulators on display at CES by Simcraft but I wanted to get these pictures online . We had a nice talk with Simcraft’s CEO about his plans for moving forward with this remarkable driving simulation tool. Rather than the arcade market with its liability challenges he explained that one of Simcraft’s major projects right now is a contract with the Department of Defense to use the simulators to train drivers for high speed runs when they must avoid IEDs in Iraq and other combat environments. At $44,000 this is not accessible to most but with a remarkable cage suspension system that gives the driver 3 degrees of motion this really is likely to be the sim of choice for high end drivers who can pony up the cash. 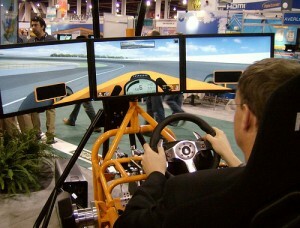 Autoblog has more on this device – easily one of CES’ most impressive demos.